Disaster recovery plans (DRP) are becoming a key part of an organization’s overall planning process because they ensure continuous availability of an organization’s critical infrastructure at all times. A major component of these plans involves protecting business-critical data through backups and data replication. However, many organizations today have either inadequate DRPs in place or none at all. This is a major potential hazard because data is constantly threatened by hackers, viruses or natural disasters. The risk became catastrophically clear in 2005, when Hurricane Katrina devastated the Gulf Coast, impacting countless organizations. Companies with DRPs in place fared much better than those without such contingency plans. Thus, it is vital for every organization to have a DRP drafted, tested and implemented. In the aftermath of Hurricane Katrina many universities have drafted and implemented DRPs. Many, however, still have not. This project focuses primarily on universities in the Gulf Coast area of the United States which suffered major losses of data due to Hurricane Katrina. The results are compared with that of Houston Community College (HCC) in Houston, TX, which proactively developed a sophisticated DRP post-Katrina, and used its DRP to recover rapidly from the ravages of Hurricane Ike in 2008. It is evident that DRPs are crucial for the protection of all universities. 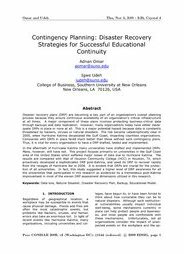 In fact, this study suggested a higher level of DRP awareness for all the universities that participated in this research as evidenced by a tremendous post-Katrina improvement in most of the eleven DRP assessment dimensions utilized in this research.